StageBuzz.com: "The Atmosphere of Memory" -- A Question of "what," "if," and "when"
"The Atmosphere of Memory" -- A Question of "what," "if," and "when"
Profanity-laden and at times hilariously vulgar, David Bar Katz's comedic-drama The Atmosphere of Memory looks at images of the past as they actually happened, how they are remembered in the present, how people want to remember them, and how they never happened. If that seems somewhat confusing, so is the play itself at times with Katz perhaps throwing in too much and going too far afield in his exploration of this subject. Yet underneath all the excess verbiage and staging is a fascinating story of a twisted family dynamic. Jon (Max Casella), a playwright, is in rehearsal with his latest show. 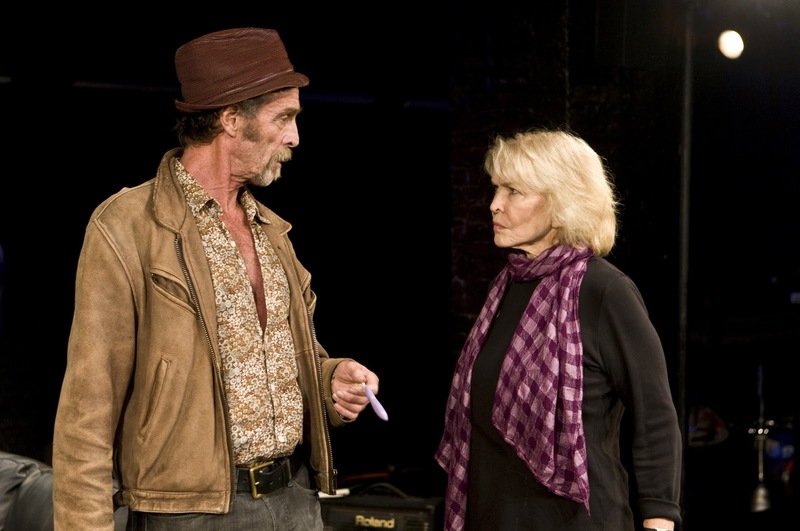 One in which he cast his own mother, Claire (Ellen Burstyn), to play his onstage mother; while another actor, Steve (David Deblinger), plays Jon. The play deals with Jon's painful remembrances of his own family upbringing. A history involving Claire, Jon's sister Esther (Melissa Ross), and his long-estranged father Murray (John Glover). However as Steve points out, the onstage character of Jon is too much of a cipher; with the script being too indistinct to really connect with the people Jon is trying to depict. Jon has written the play because he's "just trying to find out what happened;" being firmly convinced there was some major childhood incident that changed his life, one which he has since blocked out, and is now determined to uncover. In his quest to do just that, Jon gathers his family together, the first time in years they have all been under the same roof, with Murray recalling some rather pointed details of past exploits, (such as how Jon was conceived on the kitchen floor). All the while Claire tries to act as the family peacemaker and voice of reason, while Esther is more concerned with just trying to stay above it all, having long since moved on with her life. If there is one thing Murray, Claire and Esther are united about, it's that there was no one defining or traumatic incident in Jon's childhood that shaped him into the person he is today. Certain his family is hiding something, Jon brings out stacks of notebooks containing his memories of what went on around him as a child. That is, after he first tape recorded them. (How he was able to get this information in the first place is revealed as a pivotal plot point.) Jon then convinces his family to begin acting out the incidents in the notebooks in an attempt to finally get to the truth. The basic point of Katz's work, as mentioned above, is that memory is highly subjective, and one often remembers what one wants to remember, rather than what actually occurred. Also pointed out to Jon repeatedly is that he wrote nothing down about himself from his childhood. However in giving us almost no clue as to who Jon is, Katz has created a character that is basically a blank slate. So much so, it's impossible to get inside his head, which hurts the credibility of this wannabe lynch pin of the story. The play would also have worked so much better were Katz to have concentrated on this family relationship, rather than tossing in other actors playing different versions of Jon, Esther, Claire and Murray. Katz's efforts to tell the story via a play-within-a-play format results in a hodge-podge that encompasses everything from Nazi Germany to ancient Greece. There's also a time-traveling troubadour (Sidney Williams) whose job it is to narrate the action; a practice which gets annoying rather quickly. True, that character is designed to be rather less than appealing, but that doesn't take away from the reality that he isn't needed in the first place. A dramaturg would have definitely helped to eliminate some of the extraneous material and keeping the entire piece on track. One major thing the play has going for it is a seemingly endless supply of theatrical anecdotes, as well as a running gag of how cynical and shallow actors can be -- the latter point becoming evident in a scene between Jon, Esther and Helen (Kelly Curran)-the actress portraying Esther; Helen also being Jon's girlfriend. An enjoyable treat for theatre insiders, though audience members not plugged into that world may feel somewhat left out. Casting is a mixed bag. Glover steals the show as the foul-mouthed, loosely moraled reprobate who, to his credit, makes no apologies for who he is or what he's done. It would have been nice however it the character had more of a backstory. Ross is adequate in the role of Esther, who pointedly calls Jon out over his perhaps revisionist history. Yet at the same time, we never really know much about this character either, and we're sort of left hanging as to how she figures into it all. Burstyn, on the other hand, is simply wonderful as the seemingly long-suffering and iron-willed matriarch. Yet she's also a person who has more than a bit of Nurse Ratched in her and who may hold some of the answers Jon seeks. Curran, Deblinger, Williams and Charles Goforth (as the director in Jon's play) work well, through they're all pretty much one-dimensional figures. There's a hilarious scene between Deblinger and Goforth which opens the piece and can't be reprinted here, but sufficient to say one will go from wondering "what the hell is going on?" to "I shouldn't be laughing, but I am." Pam MacKinnon's direction is very good, and she choreographs the sequences with Glover, Casella and Burstyn expertly; but the scenes of Jon's play mostly miss the emotional mark, causing the show to drag whenever they're staged, thus severely crippling the work overall. Yet despite all the excess material, both Katz and Mackinnon are able to frame the story in such a way that the core characters and material are able to hold the audience's interest throughout. There's a lot to be said for The Atmosphere of Memory and there are some good performances for the audience to appreciate. However the play as whole isn't quite where it needs to be. At least not yet. Also in the cast are Paul Kandel and Kelley Rae O'Donnell.